I am very glad to read from you today, it is a very great pleasure for me to have a good Muslim brother like you. May Allah bless you abundantly. Thank you for your mails that represents a great encouragement for me. Presently, I am lodging in a hotel for now until this issue is solved successfully. Life is hard for me here but Allah will help me and also with your help, I believe that things will change. I don't fear any person again because Allah will take care ofme and I strongly that with prayers I will soon be out of here and will meet you in your country to retrieve the box. Since the death of my Mother, I have stopped my job for now so that I can solve the case at hand. Iam just managing myself to see that everything is successful. After mylast mail to you, I now decided to give you all the instructions and contacts of the security company so that you will be able to contact them; Also, I thank you very much for the telephone number you gave me and I assure that I will call you as soon as possible. What I explained to you in my first mail is a complete ordeal of the situation which I have been passing through after the painful death of my mother, and you need to keep everything secret and confidential. however, with your promise to help me out, I have no more fears or worries. I would have love to invite you to come over to see the situation by yourself and both of us will go together to the security company where the trunk box has been deposited, but in a situation where you may not be able to travel down, I will then suggest, as you said, to contact, them either by calls or by mail telling them that you are a family relative, and since the death of my Mother, you have not been able to come forward to Abidjan for the claims of her consignment. Now you will ask them to send the box to you using diplomatic coverage; Also, ask them to tell you the requirements andprocess of sending the box to your country address . Kindly find bellow the necessary information both about the trunk box and also the security company. You will need to specify the trunk box details in the mail you will address to the security company for reference. Now this is the contact information of the security company. You can contact them directly by telephone or email.Just introduce yourself to them and carefully follow the guideline I have given you previously. Please do not tell them that the consignment contains money, because my mother disguised and registered the box as family valuables for the safety and security of the money in the box. When necessary and appropriate for my travel to meet you for the collection, I will send you a copy of my international passport, I am arranging it for now. 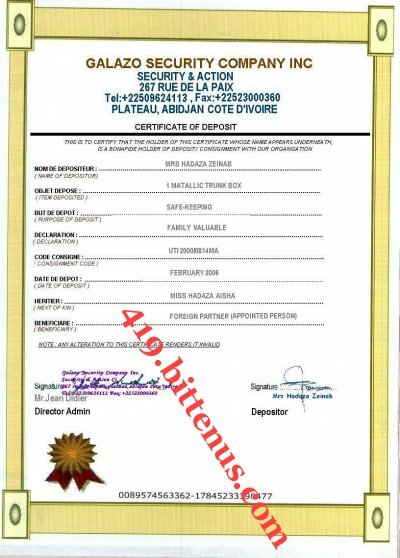 Also, find attached a scanned copy of the certificate of deposit of the box signed in the security company custody. As you will see on the document, am the next of kin but still do not understand why they refuse to release the box to me.